Drive through and drive in racking is the best option for multiple quantities of the same SKU, particularly when there is a premium price on available floor space. This configuration of racking has the greatest possible percentage utilisation of floor space, whilst protecting your product by eliminating the risk of compression damage. 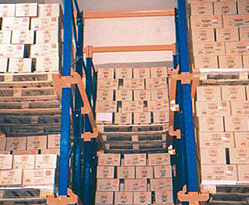 Drive through and drive in pallet racking systems are tailored to suit your space, product and quantity requirements. 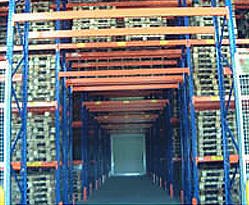 Drive through and drive in pallet racking configurations offers maximum storage density with an extremely high floor area utilisation. It is recommended for facilities with large quantities of the same SKU. Product retrieval is based on the FILO order. For more information on drive through or drive in racking systems, contact us today.